“I believe in democracy, there is no such problem, for which the democracy and healthy democratic forces would not be able to give answers”, said V. Yushchenko. Those, who have not signed the personal agreement on the democratic coalition, have to do it as faster as possible, said President of Ukraine Victor Yushchenko at the news conference for Ukrainian journalists in Bucharest. According to an UNIAN correspondent, the President turned with the request for those, who have not signed the agreement yet: “I would ask those colleagues, who have not signed the declaration at the personal level yet, to do it as faster as it is possible”. 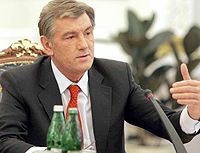 At the same time V. Yushchenko underlined that it is very important to have special attitude to the process of creating the democratic coalition and, possibly, throw away the offences, and to apologize each other”, said the President. He stressed on the necessity to do everything possible in order the democratic coalition to take place.